Tree planting, an annual practice in Lunar New Year (Tet) festival initiated by President Ho Chi Minh, took place in various localities nationwide on February 11, the seventh day of the first lunar month. 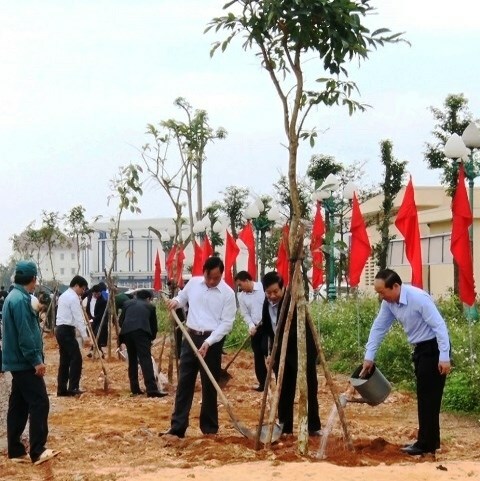 In the central province of Quang Binh, local leaders and representatives of provincial departments and agencies planted 410 trees along Van Cao street in the downtown of Dong Hoi city after a launching ceremony. Also on February 11, the northern province of Ninh Binh organized a similar ceremony to launch the festival. Earlier on February 10, the sixth day of Lunar New Year 2019, Party General Secretary and President Nguyen Phu Trong launched the New Year Tree Planting Festival in Viet Cuong commune, Tran Yen district, the northern mountainous province of Yen Bai. On November 28, 1959, President Ho Chi Minh wrote an article which was published on Nhan dan (People) newspaper, stressing the significance of tree planting to each person, each family and the entire nation. It has since become an annual custom each Lunar New Year in Vietnam.